We have come a long way. I remember the first day I connected to the internet (was it 2002? Yes) using a dialup modem I just installed. The series of weird dialing tones you got when you pressed the connect button - and voila!!! You are connected. Dialups were so costly those days, had to keep a track of my internet usage (@56kbps :D ). I remember the first mail account I created - it was hotmail - and I still log into the mailbox every once in a while (not to mention the number of times it got deactivated coz of non-usage). That was how I looked at internet some 8 years back - have a mailbox to receive and send mails - the only way to connect to friends. 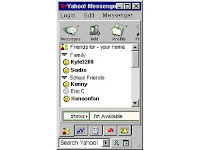 And then there was Yahoo chat. All my friends used that. And of course, Google was still there. Our online presence was limited to mails chats. I guess, for me, it was Google's new services in 2005 which started changing how people used the web. Gmail came, with it came an integrated chat client. With the same google account, you could now use Picasa to share pics with friends (I remember the pain in attaching all the pics in mail and sending it to friends earlier), social networking revolution with the introduction of Orkut, blogs, YouTube etc etc. I have noticed a shift in the trend from those early days of my internet usage. I used to write mails to friends, share pics with them. But now, its more about broadcasting "whats on your mind" to all the people you know at the same time (and sometimes, to people you haven't even met before) - thats what the social networking sites do. It all about "publishing" your thoughts. I hardly use my personal mailbox to send message to a friends asking how is he/she doing - now I just post a message on his online scrapbook/wall, open for anyone else to read!! With online services dedicated in broadcasting what you are doing (Twitter), to sharing interesting links online (Digg/ Delicious), to sharing your musical tastes (LastFM), we have a lot of services online these days to help you have your presence in the Internet. Everything seems to be shifting towards social networking. Yes, read that. Now that I landed in your blog, I need to subscribe to your posts. Put a "subscribe me" widget asap! !